Y.K. Almoayyed & Sons, the sole distributor of Nissan vehicles in the Kingdom of Bahrain, had recently partnered with HHSK Bahrain’s Strongest Man Championship that took place in the Bahrain International Circuit (BIC) from 21st to 23rd February, 2019. Nissan Bahrain had signed as the ‘Official Transportation Partner” in this championship. This event was organized under the royal patronage of His Highness Shaikh Khalid bin Hamad Al-Khalifa, First Deputy President of the Supreme Council for Youth and Sports, President of Bahrain Athletics Association, Honorary President of Bahrain Disabled Sports Federation. 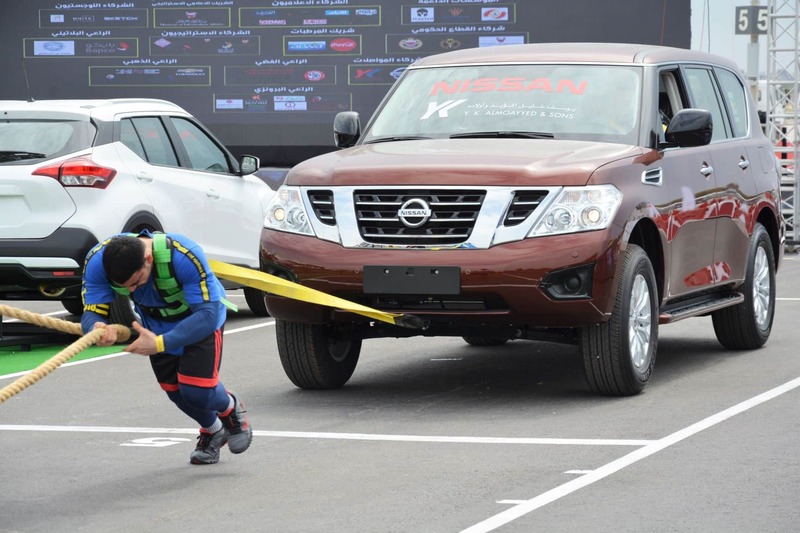 “Nissan Bahrain was delighted to be a part of the Bahrain’s Strongest Man Championship by providing 5 Kicks, 5 Altima, 5 X-trails, 5 Patrols & 5 Civilian Buses as weight challenges for the championship,” stated Mr Arindham Chakravarty, General Manager, Nissan Bahrain. “At this event we displayed a Nissan Patrol Platinum Reserve and conducted a Pull the Patrol activation which attendees of the event had to pull in order to win a G-Shock Watch. The top 7 fastest pullers were selected by Nissan Bahrain as winners ”, he added. The winner of the championship won a Nissan Patrol worth BD 18,9995 which was presented by HH Shaikh Khalid Bin Hamad Al Khalifa. HH Shaikh Khalid also crowned the winners of the first light weight, medium and heavy weight competitions. In the lightweight division, Khalid Al-Zafairi won first place, while Shubar Abdullah and Yusuf Al-Qallaf ranked second and third respectively. In the medium weight division, contestant Ahmed Mohammed Taha ranked first, Faris Al-Kooheji was second and Issa Rashdan came third. In the heavy weight division, Salman Salem Abdullah won first place, while Hussein Ali Gomaa finished second and Ahmed Al-Mousa third. “It has been a matter of great pride and honour for us to be associated with a national championship of this stature. YK Almoayyed Group has always been at the forefront of growth and empowerment of Bahrain’s youth and this was a great opportunity for us to support that cause”, stated Mr Chakravarty. For more information, call 17732732.